Since the devastating earthquake hit Nepal in April 2015, our partners in South Asia have provided life-saving relief to the Nepali people. We are so grateful to the generous support of many donors, including hundreds of OMS supporters. Philip and his team immediately reached out to the people deeply affected in a region that other organizations didn’t. They provided food supplies for 7,000 hungry people, they distributed relief kits among 1,400 families who survived the disaster, but lost everything because of it. And they gave medicine and medical supplies to many of those who were injured. Over this past year, the people in the villages that were helped have expressed their deep gratitude, recognizing that they would not have survived this difficult situation without the assistance from our generous donors. As a result, these villagers experienced true Christian love through this support. Among the communities served, 22 villages have accepted Christ as their Savior and were recently baptized! Our partners there are now selecting leaders and training them, using the Train & Multiply curriculum for multiplying disciples and churches. The positive relationships built have set a firm foundation for our ongoing ministry in this area. God is at work in Nepal! 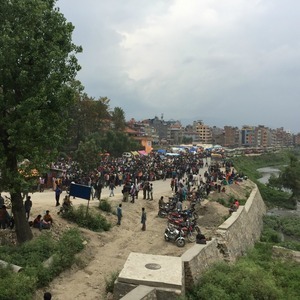 We drove five hours to northeastern Nepal, high into the mountains, to distribute chicks, goats, and food at locations that Pastor Daniel had set up the week before. We looked forward to meeting him for the first time and encouraging him and the people of the area. Pastor Daniel provides leadership and support for the people of northeast Nepal, just miles from the China boarder. 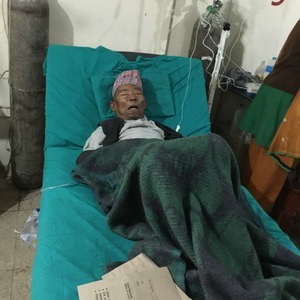 Unfortunately, just days before my wife Cindy and I arrived in Nepal, Pastor Daniel was involved in a bus accident and was injured and had to have surgery, along with his one-month-old child, who suffered a broken leg. He and his baby are doing better, but Pastor Daniel’s injuries will take a long time to heal. Many times when you have a strong leader who is taken out of ministry for a while, this brings discouragement to the community. They are afraid they cannot go on without their leader. Even the other local pastor began to shut down, believing that the community couldn’t continue without the main pastor. Our faithful partners from South Asia called all the pastors of the area to come together to talk about how to move forward while Pastor Daniel recovers from his injuries. They received a powerful message about working together as a team and moving forward with the plans that Pastor Daniel had already set in place. We’re thankful that they did just that, and the ministry is moving forward during Pastor Daniel absence. Philip and our South Asia ministry partners have identified 13 Nepali villages that were badly affected by the earthquake and monsoon rains to receive help and support from OMS. These villages are a 5-6 hour drive from the capital city Kathmandu. The villagers are mostly marginal farmers, growing crops on the hillsides, but due to the heavy rains and landslides, they have lost their crops. Philip and his team will help the 600 families most devastated by the earthquake. Our goal is by the end of fifth year (the 7.8 magnitude earthquake hit Nepal in April 2015), 80 percent of the beneficiaries will be self-supporting with the help of the chicks and goats we provide for their livelihood. We also hope to see less sickness with the health education provided to prevent diseases. And we want to see fewer landslides due to the tree plantation project. 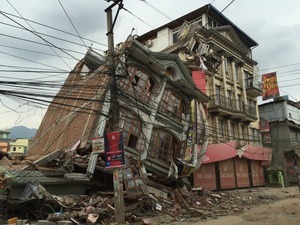 Click here to donate to the Nepal Earthquake Relief Project. Just a little over a month since the devastating earthquake struck Nepal, homes and lives are still in ruins. Because it is no longer in the news or shared through the media, we can be innocently fooled into thinking that the problem is better. It is not! The people of Nepal are still frightened, devastated, and without hope. An estimated 2.8 million people are homeless. When we asked our ministry partners where these people were staying, they said ... "Under the stars." 1. We will serve the most remote areas where other ministries are not. This region, close to the China border, is very mountainous and hard to reach. Almost 100 percent of the people in this region lost their homes. 2. We have set plans in motion to begin providing housing to the people in this region. In less than three weeks, the monsoon season will be upon them. We need to quickly purchase materials to begin constructing quonset housing (see photos). The tin material, being shipped from India and purchased in Nepal is reasonably priced, but it is quite expensive to transport the items to these remote, mountainous regions. Total cost per house, which should last between 10-15 years, is about $500. The structure is made of tin roofing, metals poles, and plastic on each end. Our team on the ground in Nepal continues to call us every few days, or as they are able, to give updates of the situation there two weeks post-earthquake. One team member shared with us that his group had departed for Nepal so quickly that he had only taken two pair of pants and two shirts ... and no food with him. They arrived in Nepal less than 60 hours after the earthquake. Because there was no hotel space available at that time, they spent the first few days in a tent. Three days after the earthquake, a large amount of food was purchased (several ton) and a feeding program was started. They have been feeding about 3,000 people a day. They are also distributing food for others to cook. One of the churches, in a very rural area about 5 hours from Kathmandu, was destroyed and seven members were killed as they were having church service. More than 2,500 people were killed in that area. The team is sending three ton of food a day to that town to be distributed. We were told that one of the reasons so many buildings collapsed is because they were built from brick and mud, no cement was used between the bricks. A huge challenge for the country is the fact that they have not experienced a disaster of this magnitude in more than 80 years, so they are not experienced in how to respond. That's why we are so blessed to have Philip and his team on the ground there. Several of that team have a lot of experience in responding to disasters. The team has now divided into three groups so they can work in more areas. To date, 8 of the 18 pastors, who are ECC workers, have been located. One team member visited a hospital where one pastor’s wife had both of her legs amputated, and, they have not yet found the pastor/husband. More than 35,000 meals had been provided as of earlier this week. Shelter is a pressing need. The overall needs now and in the future are enormous, but it also may well be one of the greatest opportunities our team has had to not only help people physically but also spiritually. Because of so much trauma, there is a need to train and send in people to do counseling, which will provide an opportunity to provide hope that only Christ can give. The spiritual needs of the Nepali people are certainly a priority as the team is praying with the victims. Please continue to pray for the people of Nepal. And pray, too, for our team on the ground--that the Lord would sustain their energy and strength. If you'd like to donate to Nepal, please give here.